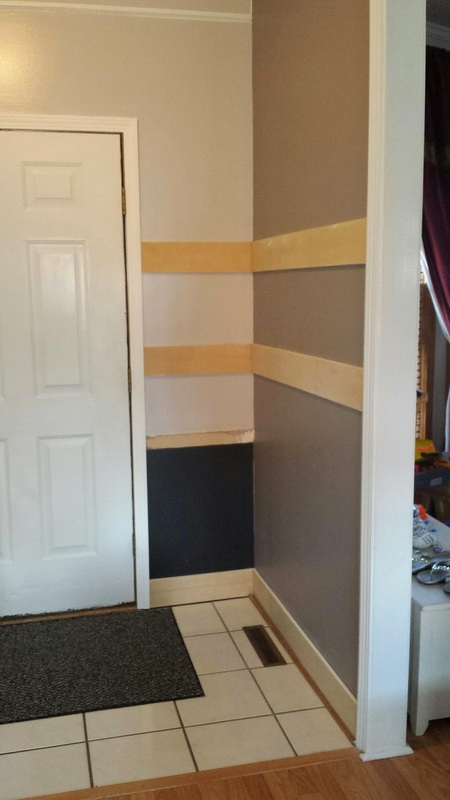 I just realized that I got so wrapped up in our Board and Batten project that I forgot to update the Door Jamb replacement job that I did! As stated earlier, I had to do this repair because the previous owners had used wood putty to cover an old metal plate and that plate was starting to show through. I was worried that it would cut someone coming into the house. The plate also pushed the trim out away from the wall which made it harder for me to finish the trim painting like I wanted too. 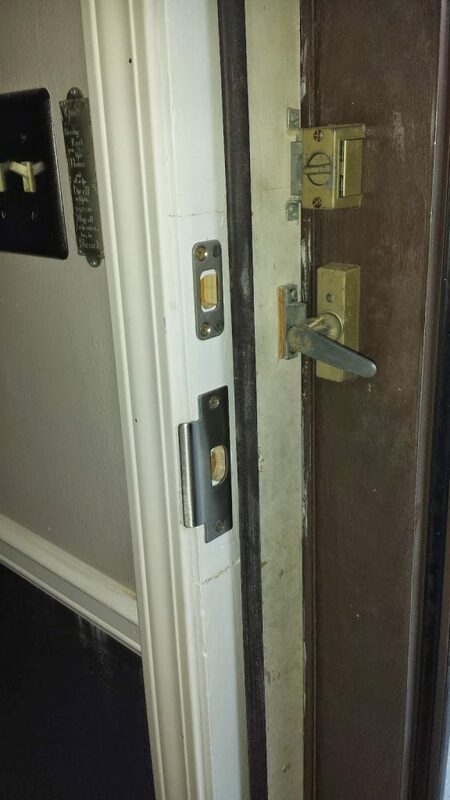 This is how the door looked with the main latch plate removed. It looks like they hand chiseled the hole larger at some point in time. To the right, you can see the plate that I was talking about earlier. Its pretty clear to see why I wanted it gone. 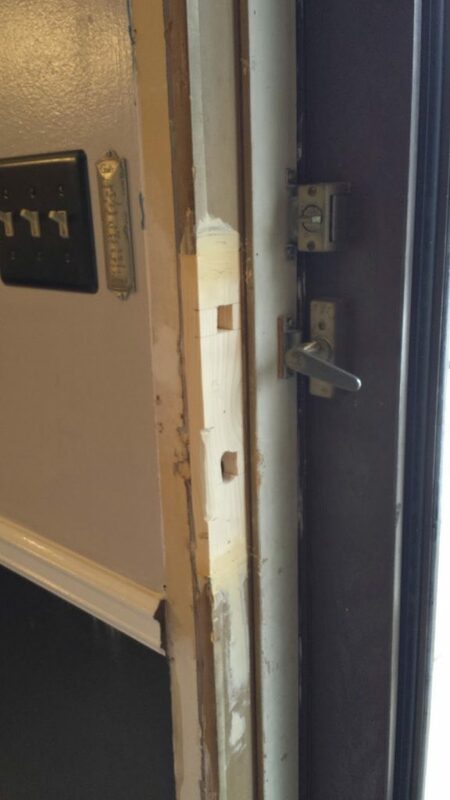 I started out by cutting out the entire section, door knob and deadbolt included. 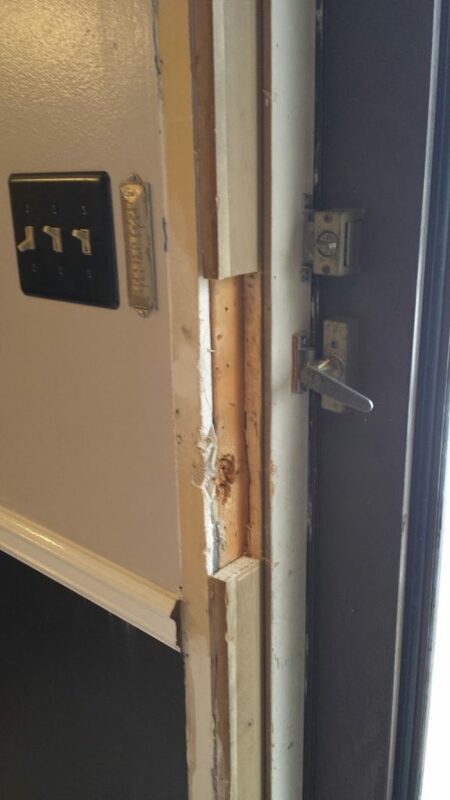 I then cut a board to fit and drilled out spots for the deadbolt and door latch plates, drilled it into place and mudded over the seams. 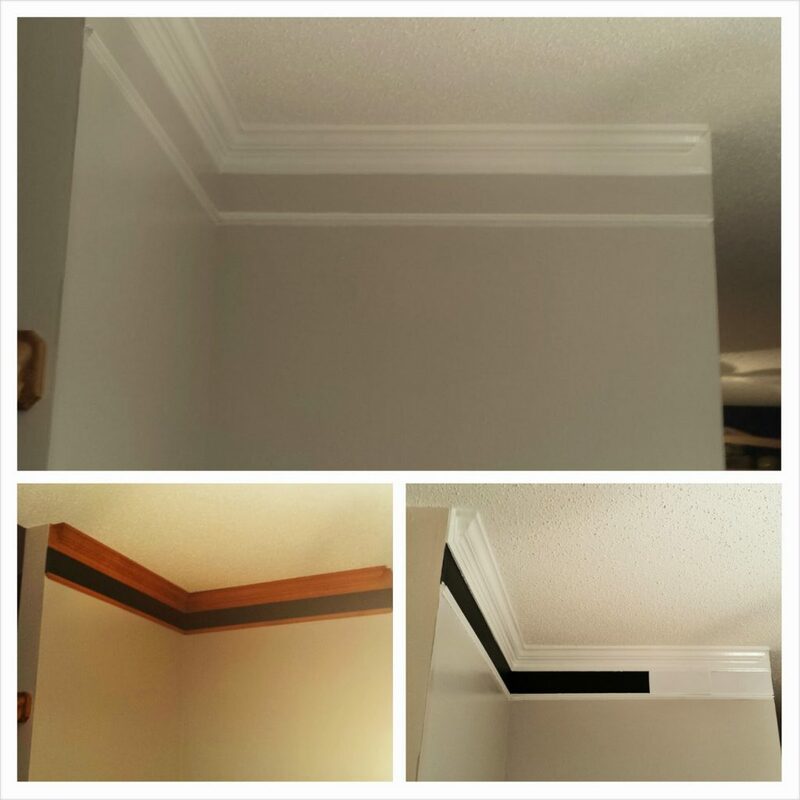 The final step was to paint the patch as well as the rest of the trim. In this photo, you can see the seam pretty well. That is because I used a hammer to try and knock the latch plate into the wood a bit. I didn’t realize at the time, it would break my seam up. I have since fixed it and repainted and its no longer noticeable. I am really happy with the way it turned out and it looks so much better than it did before. I realize that security was compromised a bit by the patch but we also have a solid storm door that is also always locked. Slowly making some progress on our coat wall. 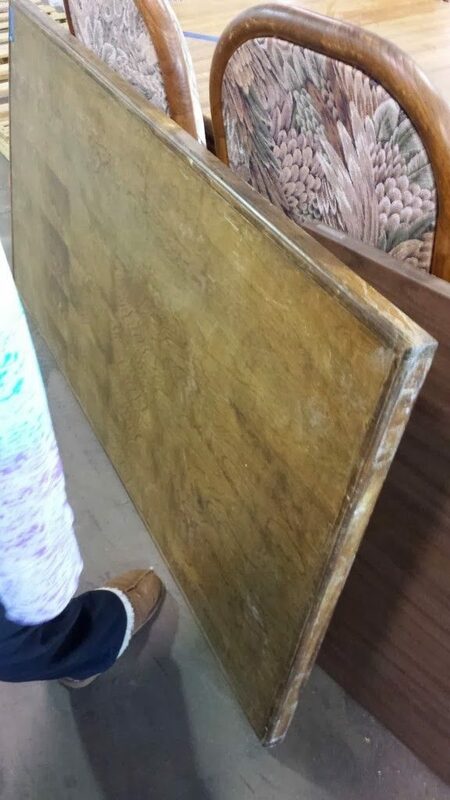 Purchased 2’x4′ sheets of MDF at Home Depot so its taking a bit longer to put up and I have to actually cut each piece before I nail it to the wall. I’m also applying some wall compound to the edges in order to help with the painting process. I really hope to have all the wood up by the end of the weekend. It seems that every time I turn around or go on Pinterest, I find another project that I want to start. The problem with that is it makes it really hard to concentrate on the project at hand. Case in point, I have been looking at ways to redo the arches that go into our toy room (officially its a den). I have already painted them from the drab honey oak to the white but I feel like they are missing that visual appeal that makes people say “Wow!”. 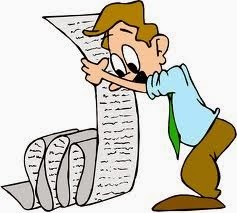 I am getting tired but anxious just looking at this list! A friend recently introduced me to SketchUp and I cannot stop using it!. What an amazing (and free for personal use) tool for the DIYer. One of my biggest hurdles when coming up with a new project is how to best design it so that I know what its going to look like ahead of time as well as the ability to show my wife my ideas. I know that I am not very good at explaining ideas and I am even worse at drawing but with SketchUp all of my problems are solved! Below are a few things that I kicked out in about 10 minutes each. As I continue to practice, I am finding that I can create these quick and cleaner. They aren’t to scale but I really don’t care. Its more for the visual anyway. 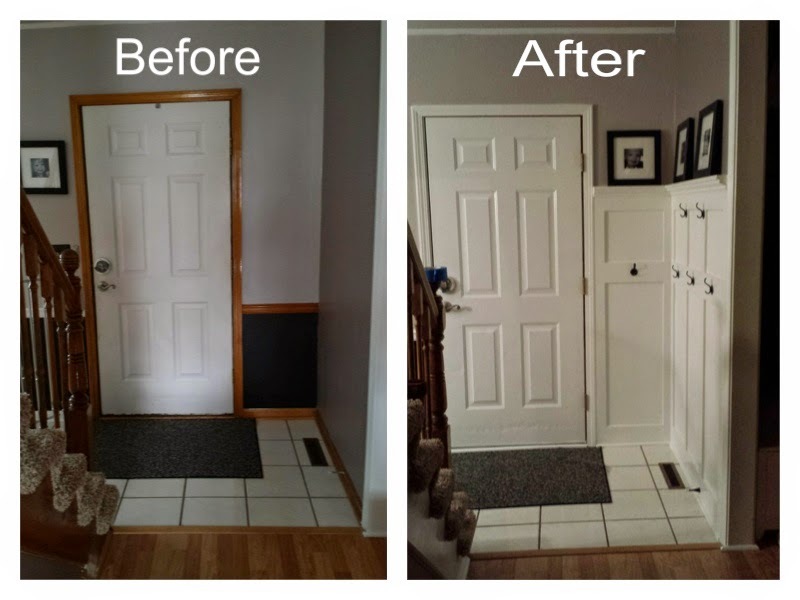 The first one is a coat wall that Ashley and I have talked about for awhile and the second one is an idea I had to update the look of a few archways that we have on the main floor. Now that I am painting all of our Honey Oak Trim white, I decided that I should fix a little issue we have with the trim around our front door. The trim next next to the door latch was sticking out about a 1/4″ from the rest. 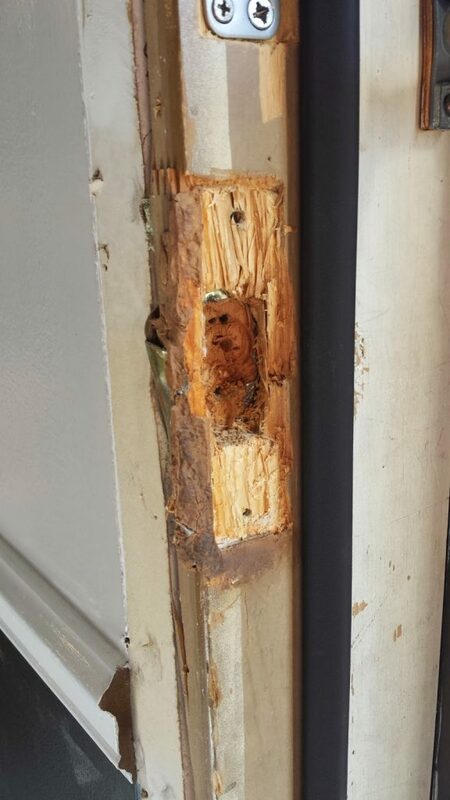 This was caused by the previous owners doing some sort of DIY fix that involved bending metal and wood putty. I am not sure the reason for it but it was in serious need of repair and even a little dangerous as some of the metal was poking through the wood putty. The picture below depicts what it looked like under the latch housing that I removed. I am still confused by what their plan was. I am currently working on cutting this section out. I will then put in some new trim and latch plates. Hopefully once its all patched and painted, no one will be able to see tell the difference. It cannot be any worse that it was. 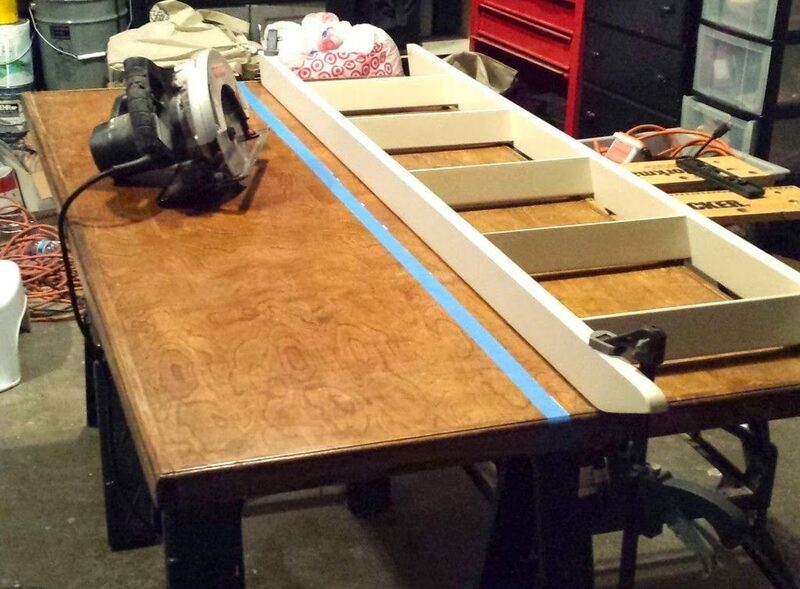 I am also going to try and move the plates back a little bit to allow for a more snug fit against the door moldings. There gets to be a bit of a draft coming through the door. 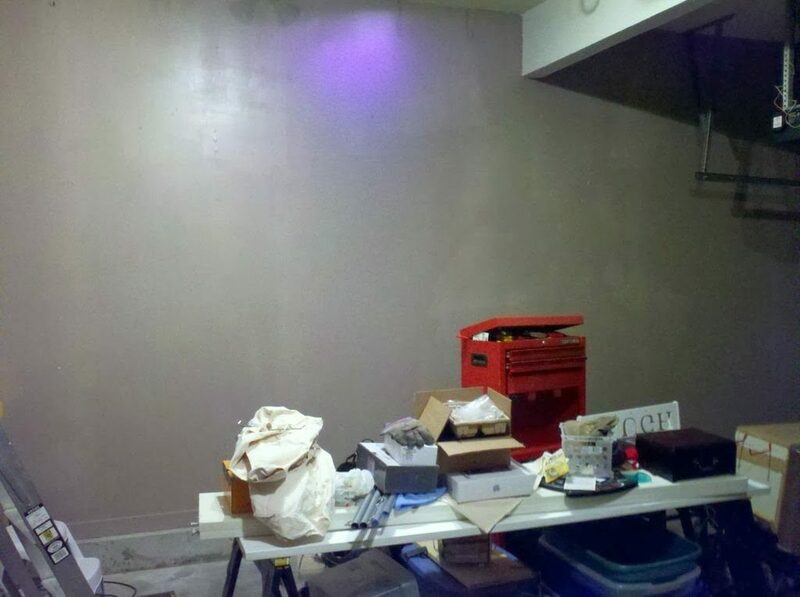 After much debate, we decided to paint the black portion of the wall to match the rest of the wall. It took a few days for me to get used to it but it has grown on me. I am still not 100% crazy about the overall color of the walls but I do like the fact that it all matches. 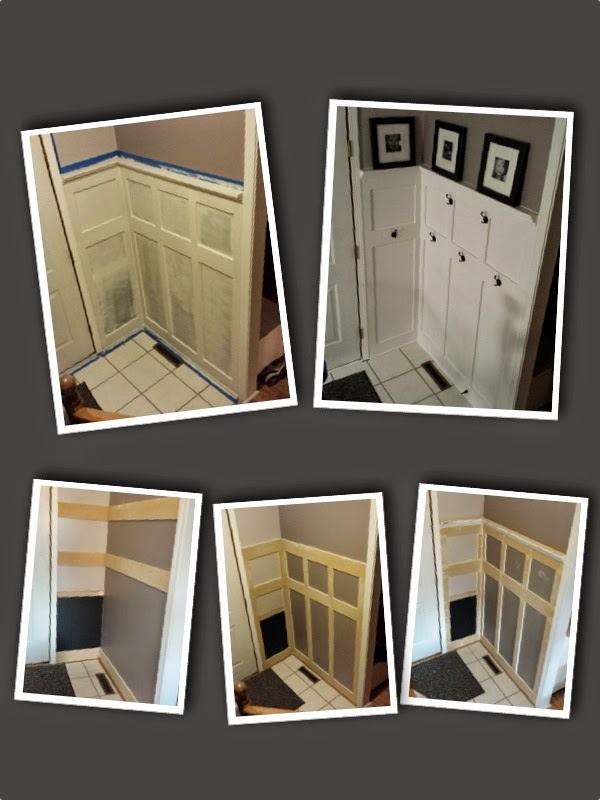 I have since moved on to painting the hallway trim as well as the half bath and laundry room door trim. Its amazing to me how much a little color over wood really transforms the look of a house. I feel like our home is gaining back 20 years with just some paint. Love it! The latest addition to our home. This started out as a generic frame from the store that I beat up, sanded and glazed. 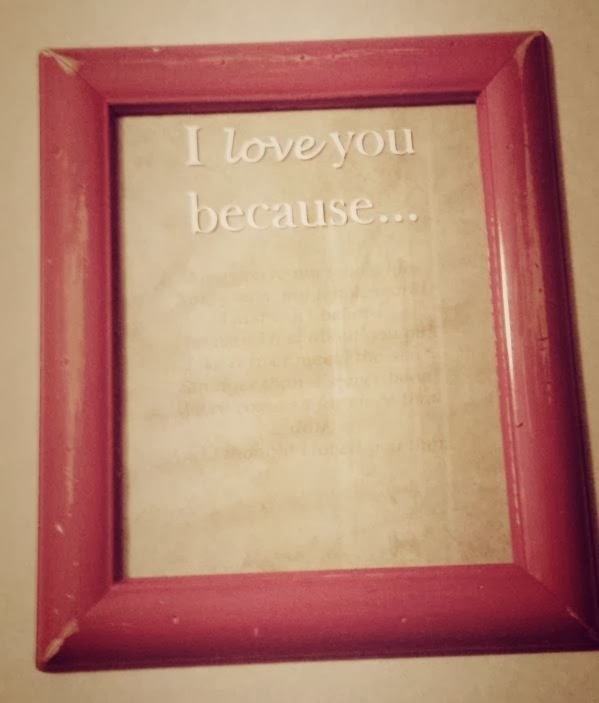 The backing was scrapbook paper that I printed out the chorus to “our” song onto. I am lucky enough to have a buddy that can cut vinyl letters and that is where I got the letters from. I presented my wife with this gift last night and she loved it. 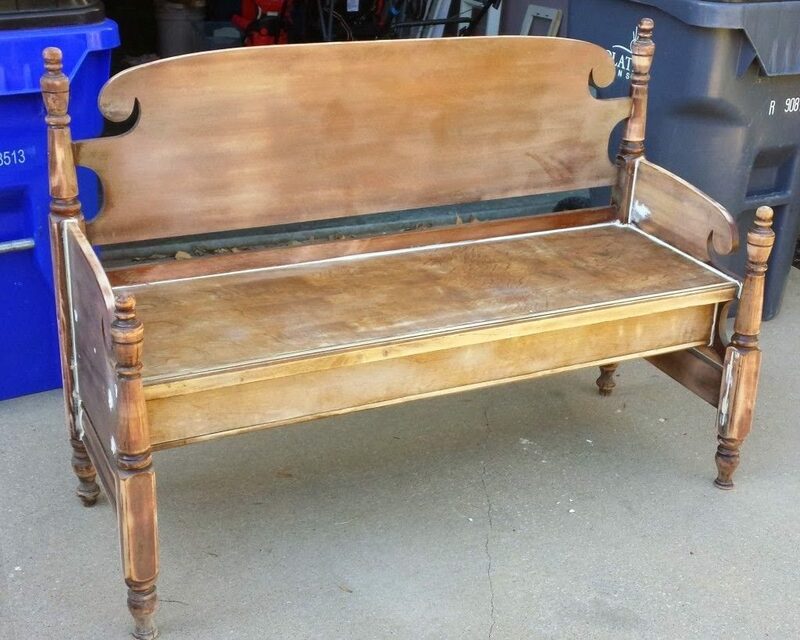 A few weeks ago my sister-in-law sent me a picture of a bench made from a headboard. The request was simple, “Can you make something like this?” Of course I answered “absolutely”. I mean, I have never done one but it seemed simple enough at the time plus I was pretty sure that it would be awhile before I was called upon for my services. 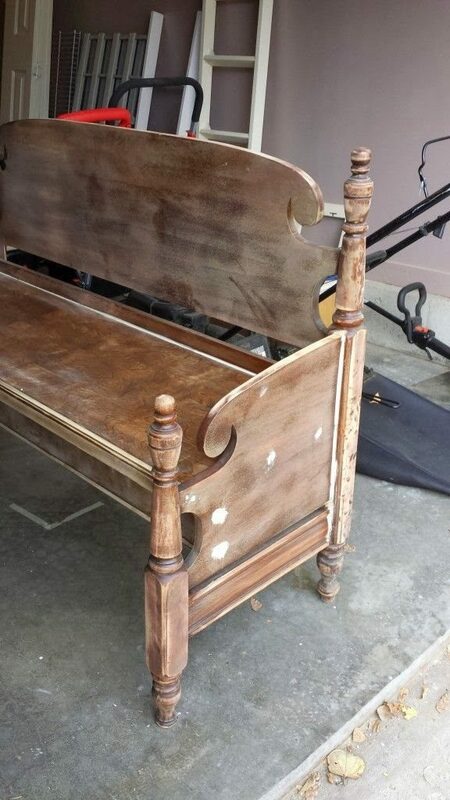 Well low and behold about a week later, I had a headboard and footboard sitting in my garage ready to go! This looked simple enough. 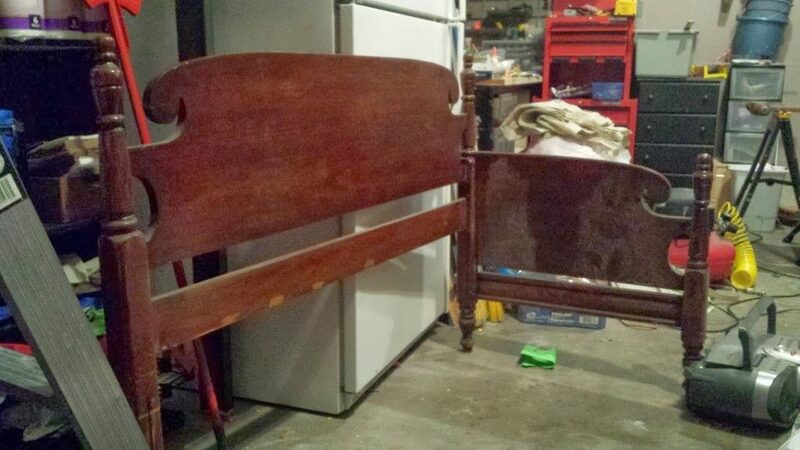 Cut the footboard in half, attach it to the headboard and then find something for a seat. 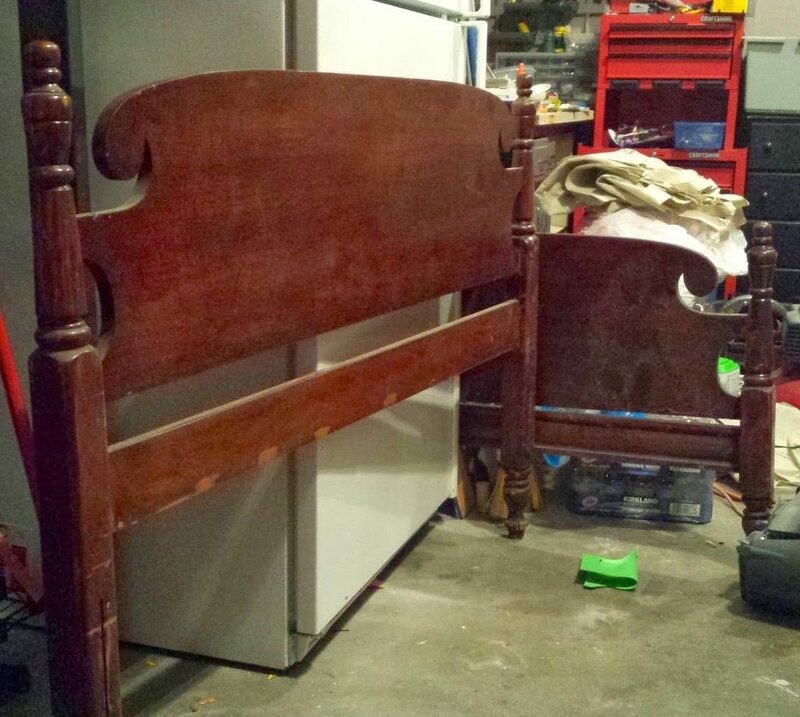 Well when I first cut the footboard in half and mocked it to the headboard, I noticed that it caused the bench to be too deep. 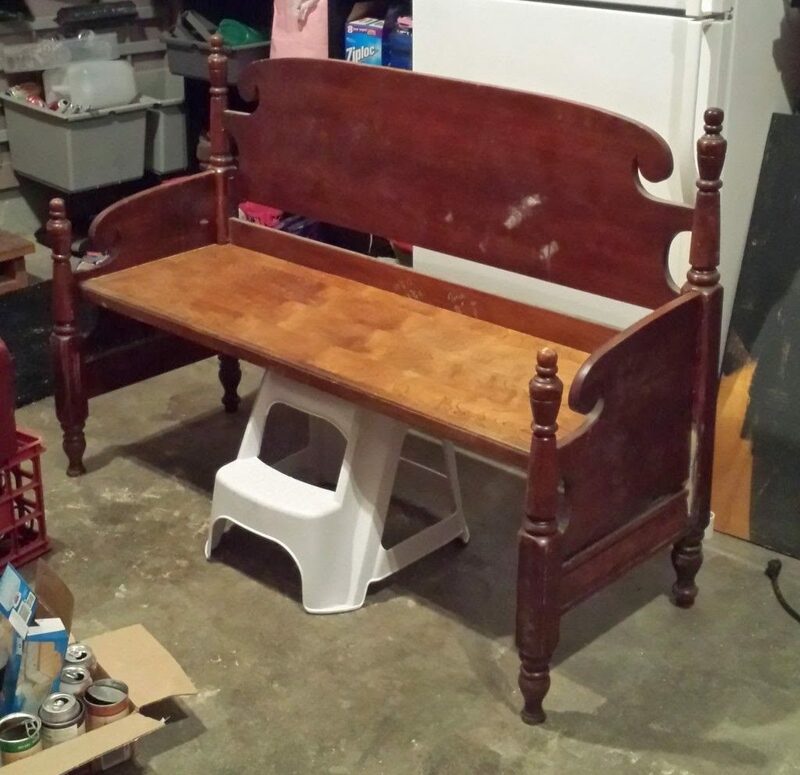 If I had continued on, it would have looked more like a daybed than a bench. 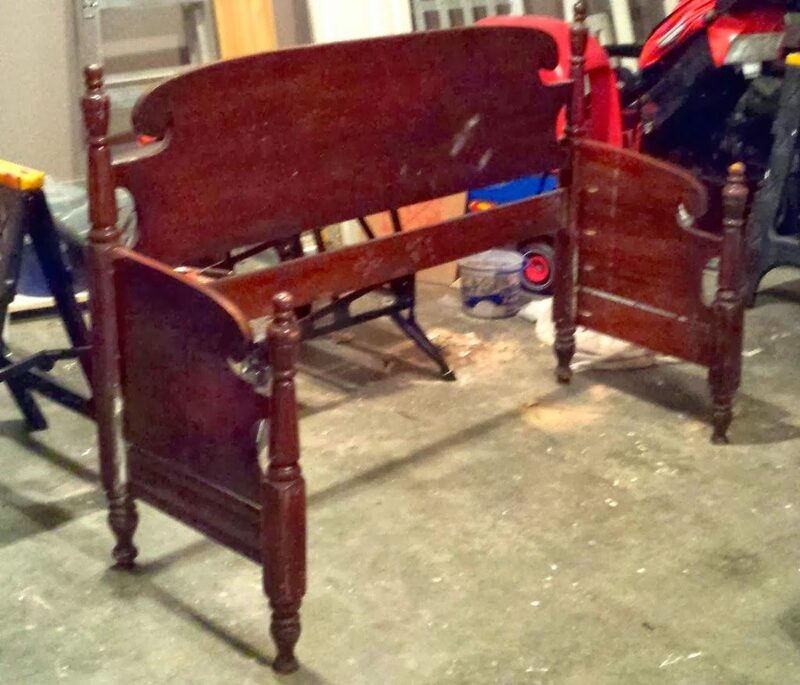 So I concurred with my “customer” and we agreed to knock another 12′ off of each side of the footboard. Now we had something that more closely resembled bench dimensions! 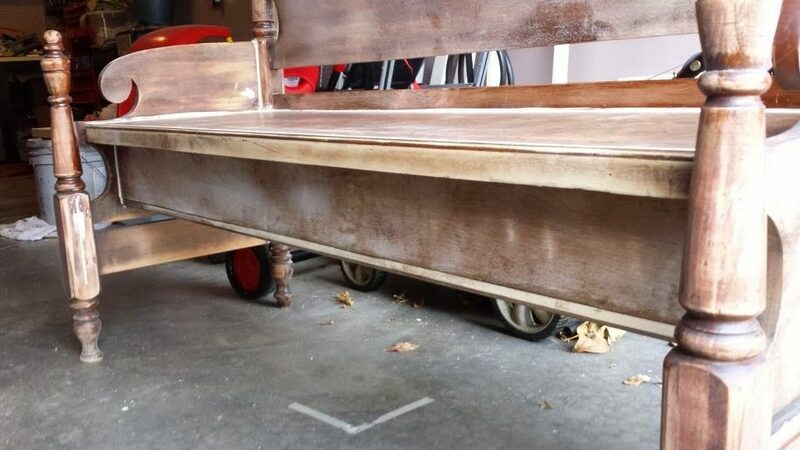 Now that the footboard was cut to the right size and I was able to dry fit it to the headboard, I noticed that it was too tall to make a solid connection to the headboard. 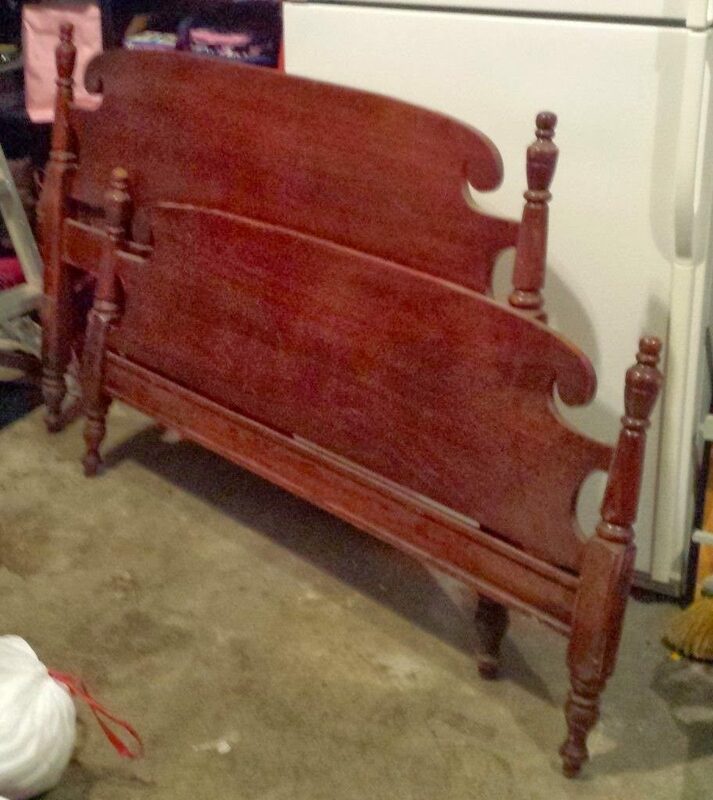 At current height, I would have had to attach the footboard to the curved portion of the headboard. This just wouldn’t do. The only logical choice was to cut a few inches off of the bottom of the footboard posts. The purpose of this bench is to be used as a prop for my sister-in-law and her husband to use in their photography business. With that in mind, I wanted to build it sturdy and capable of holding up to any customer regardless of size or sitting position. So I added three wooden dowels to each side to help reinforce the weight that could be placed on it. I then drilled pilot holes from the back, and used three wood screws to draw it all together. 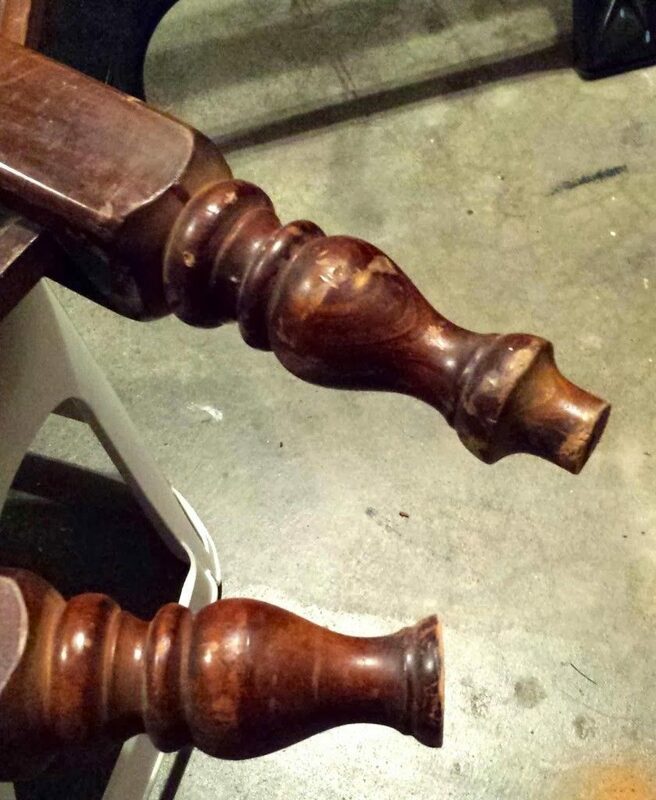 This bench is not going to fall apart! With the footboard securely attached to the headboard, I now needed a seat. I thought about purchasing some wood from Home Depot to use but I didnt think it would blend well with the weight and design of the rest of the bench. So I headed out to my local Habitat Restore in search of something that could be used for the seat. That is where I ran across a sweet (and heavy) table that was missing legs. It was perfect…and cheap! 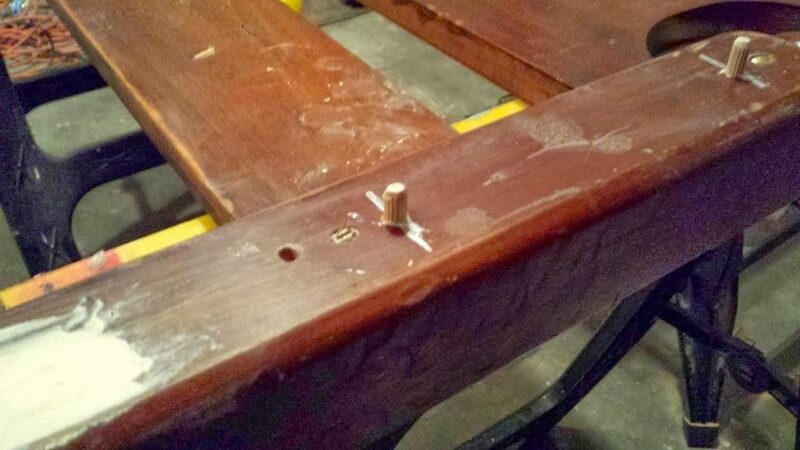 The new bench top was attached to the rest of the bench using wood screws. I continued to drill pilot holes to help avoid the wood splitting and countersunk all screw heads below the surface in order to later come in and cover with wood putty. After I had it all attached, I sent pics to my sister-in-law and her husband and although they loved it, they felt that something should be below the seat to help “fill-in” the empty space. I agreed completely. As it currently stood, it looked a little “long” legged. Back to the tabletop I went! I cut a section off and attached it vertically right below the seat. A quick sanding, some holes filled and joints caulked and we now have a bench! All that is left is a paint job. Once that is complete, I will be sure to post updated pics. I love having a plan for projects but sometimes things just come together as you go. That was the case for this bench. I started with an idea of how I wanted it to look and I ended up with something that I am truly proud of. Best of all, my sister-in-law loved it! Ashley and I are getting ready to welcome the newest member into our family so my time posting will slow down for a bit. Don’t worry though, I still have plenty of DIY projects and posts in the works, it might just take a bit longer to get them up. I am thinking the first one back will be our new nursery which is amazing! In the meantime, please enjoy this picture of my garage wall. Yes, I am painting my garage walls. Basically I had 8 gallons of paint that I needed to get rid of so I combined them all into a very large bucket and am using that to paint my garage. I am also working on a total revamp to my workspace and when finished should allow me to work on projects easier without impacting my families ability to use the garage.